People across Mexico are being forced into migration, and while 11 percent of that country’s population lives north of the US border, the decision to migrate is rarely voluntary. Free trade agreements and economic policies that exacerbate and reinforce extreme wealth disparities make it impossible for Mexicans to make a living at home. And yet when they migrate to the United States, they must grapple with criminalization, low wages, and exploitation. 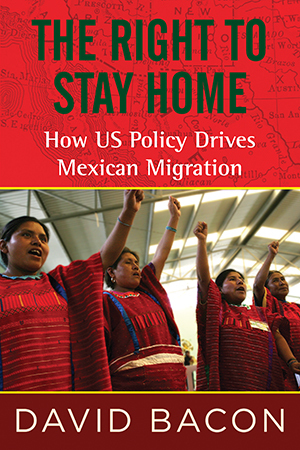 In The Right to Stay Home, journalist David Bacon tells the story of the growing resistance of Mexican communities. Bacon shows how immigrant communities are fighting back—envisioning a world in which migration isn’t forced by poverty or environmental destruction and people are guaranteed the “right to stay home.” This richly detailed and comprehensive portrait of immigration reveals how the interconnected web of labor, migration, and the global economy unites farmers, migrant workers, and union organizers across borders. In addition to incisive reporting, eleven narratives are included, giving readers the chance to hear the voices of activists themselves as they reflect on their experiences, analyze the complexities of their realities, and affirm their vision for a better world. “Americans mostly think of immigration in terms of its impact on the US. David Bacon’s work reminds us that migration has a profound impact on the places migrants leave from, just as surely as it does on the places they go to. He argues persuasively that the right not to migrate cannot be divorced from immigrant rights. The heart of his work is in human stories, and this book validates its ideas with vivid testimony, in migrants’ own words, from those most affected.” —John W. Wilhelm, president of UNITE HERE!